På fwbo-news berättar Aryapala, från Padmaloka, om deras senaste målning – en ny av Aloka, denna gång av Buddha Amitabha. De har planer på att täcka väggarna i deras meditationssal med buddhabilder. Bilden på Amitabha är ca 4 meter lång och 2 meter hög, och måste se imponerande ut (klicka på bilden för en större bild!). Amitabha återges i sin klassiska form med händerna i meditationsmudran, men över hans hjärta ligger en annan bild, där Amitabha håller upp en lotusblomma. Det är också en traditionell bild, men inte så vanlig. Den kopplar också an till den vision av Amitabha som Sangharakshita hade i en grotta i södra Indien på 1950-talet, tror jag det var. Man kan läsa om den i Sangharakshitas memoarer The Rainbow Road. Den finns att ladda ned från Sangharakshitas hemsida eller kan också köpas via adlibris eller Windhorse Publications. "One night I found myself as it were out of the body and in the presence pf Amitabha, the Buddha of Infinite Light, who presides over the western quarter of the universe. The colour of the Buddha was a deep, rich, luminous red, like that of rubies, though at the same time soft and glowing, like the light of the setting sun. While his left hand rested on his lap, the fingers of his right hand held up by the stalk a single red lotus in full bloom and he sat, in the usual cross-legged posture, on an enormous red lotus that floated on the surface of the sea. 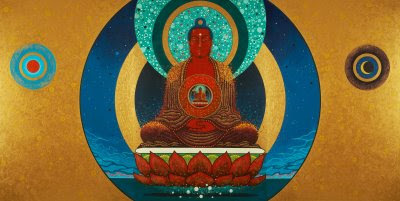 To the left, immediately beneath the raised right arm of the Buddha, was the red hemisphere of the setting sun, its reflections glittering golden across the waters. How long the experience lasted I do not know, for I seemed to be out of time as well as out of the body, but I saw the Buddha as clearly as I had ever seen anything under the ordinary circumstances of my life, indeed far more clearly and vividly. The rich red colour of Amitabha himself, as well as of the two lotuses, and the setting sun, made a particularly deep impression on me. It was more wonderful, more appealing, than any earthly red: it was like red light, but so soft and, at the same time, so vivid, as to be altogether without parallel. In the course of the next few days I composed a series of stanzas describing the vision. Contrary to my usual practise, I failed to write them down afterwards, with the result that they gradually faded from my mind. But the experience itself never faded. Nearly a qaurter of a century later, the figure of the red Buddha is as clear to me, in recollection, as it was the next morning in the Virupaksha Guha (cave)."